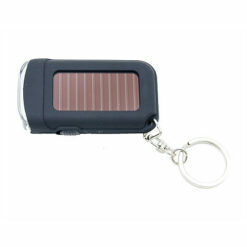 Ultimate Series Solar Flashlight ECN39892. No other solar flashlight line is as versatile as an Ultimate Series flashlight. 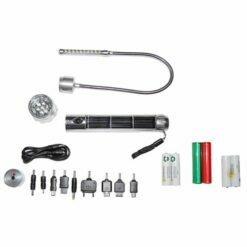 To clarify, an Ultimate flashlight is a two part illumination system consisting of a power module capable of mating with one of nine separate LED flashlight heads. 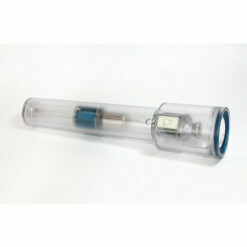 The tube shaped power module is machined from aluminum and contains two rechargeable AA NiMH batteries. Integrated into the power module is a polycrystalline solar panel, which charges the batteries when exposed to sunlight. 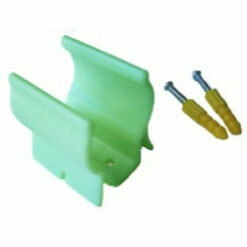 Additionally, the power module screw receptacle for the flashlight head is water resistant. 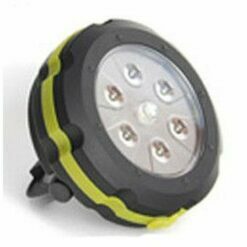 Solar flashlight model number ECN39892 includes a 7 LED flood light head coupled with a 3 watt single LED spotlight head. The flood light provides general area lighting up to 40 feet away, delivers 28 lumens of light output and operates for up to 8 hours. Separately, the 3 watt LED spotlight illuminates objects up to 200 feet distant, delivers 250 lumens of light output and operates for up to 90 minutes. ECN39892 flashlight is accessorized with a lanyard, red and green colored filters and a magnetic base. Separately, we recommended purchase of the Light Finder Glow-N-Dark Holster for convenient storage in a location that allows exposure to sunlight and maintaining a full battery charge. 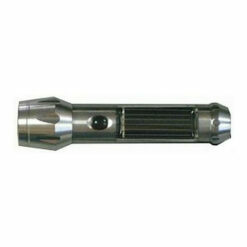 Ultimate Series Solar Flashlight ECN39892 comes with a manufacturer’s 1 year limited warranty. Batteries are excluded.